Can desert gourd (Citrullus colocynthis) found in marginal environments be the next non-food feedstock crop for biodiesel production using marginal lands? Well, the answer is possibly ‘yes’, as pilot studies conducted at the International Center for Biosaline Agriculture (ICBA) in collaboration with the Birla Institute of Technology and Science-Pilani, (BITS) Dubai Campus, produced very encouraging results. Viewed as a natural and alternative source of renewable energy with strong links to market and land use, biodiesel has been in research and policy discussion for many years. Commonly produced from soy, rapeseed and corn - biodiesel, because of concerns in using food crops and arable land for its production, moved to non-food crops such as grasses, municipal solid waste, Jatropha, algae and now it could well be desert gourd, produced in marginal lands with low quality water resources. 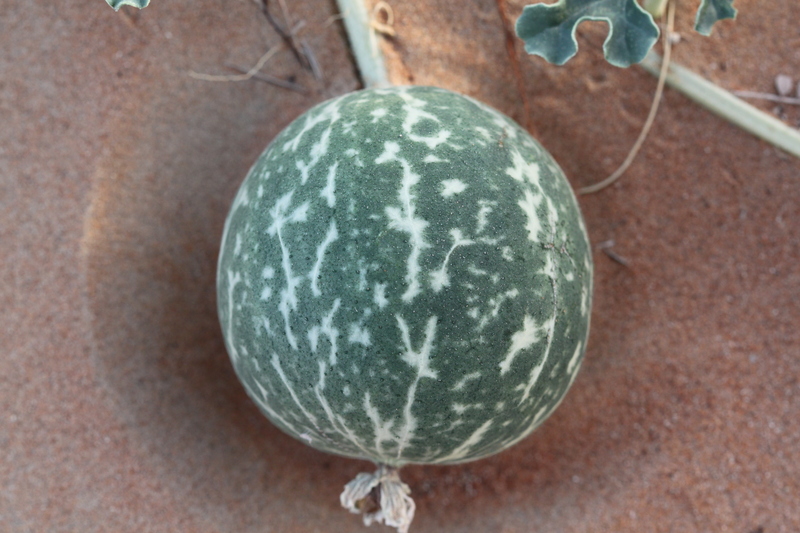 Desert gourd found in the arid conditions of the United Arab Emirates (UAE) bears an inedible, potentially toxic fruit with seeds having up to 50 percent oil content. Studied over a period of one year, involving 27 varieties mostly taken from the wild, differences were observed in seed yield, oil quantity and quality. For instance, the seed yield ranged between 12 and 374 grams per plant, while seed oil content ranged from 7.8 to 43.8 percent of the seed weight. The extrapolated annual oil yield in several accessions exceeds 1 t/ha, the highest being 3.44 t/ha – showing desert gourd as a highly prospective feedstock for biodiesel production using marginal lands. On comparing desert gourd with other feedstocks, it was found that desert gourd was higher-yielding than soy and rapeseed oil as well as Jatropha, the popular non-edible feedstock crop. Oil from desert gourd has low oil viscosity - especially of great advantage in terms of its potential as biodiesel. The major disadvantage of some other vegetable oils is the high viscosity, because of which 100 percent biodiesel cannot be used in engines, and has to be blended with petroleum fuels. Affected by climate change, poor quality land, water scarcity, and unsustainable fossil energy, countries of the Gulf Corporation Council need to develop solutions that utilize limited natural resources with more sustainable output. Desert gourd, because of its natural adaptation, has the added advantage of tolerance to extreme temperatures and marginal environments compared to other non-edible feedstock crops such as Jatropha. The wide range of variation observed in seed yield, and oil quantity and quality provides opportunity for genetic improvement of desert gourd to develop it into an economically important non-edible alternative biodiesel feedstock crop. Moreover if desert gourd were found to be a desirable feedstock, it is expected to put less pressure on the global food supply because it will not directly compete with food supply as compared to rapeseed and soy, and can be grown in available marginal lands. In addition to its potential as a bio-diesel feedstock, desert gourd has been well known in the traditional medicine. The root and callus extracts have been reported to have anti-microbial, anti-inflammatory, anti-diabetic and anti-oxidant effects. ICBA and BITS have also investigated the anti-bacterial properties of the plants’ seed, leaf, fruit pulp and rind extracts using agar well diffusion and disk diffusion assays against six bacterial strains (genetic variant).